The Mute Swan is apparently an introduced species from Europe to North America. They are one of the heaviest flying birds and can weigh 30-32 pounds! I found this adult with four cygnets swimming behind him or her at Bombay Hook Wildlife Refuge. These babies can't fly for five months so the adults better plan ahead so the family can get out before the water freezes! This entry was posted on Sunday, February 3rd, 2019 at 3:38 am. 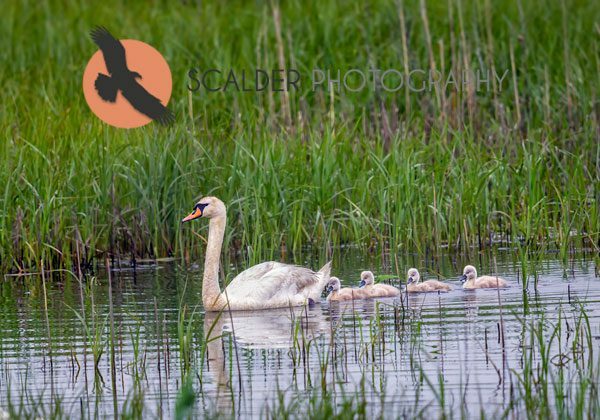 It is filed under Animals / Wildlife, New Images and tagged with Bombay Hook, Mute Swan, mute swan cygnets, scalderphotography. You can follow any responses to this entry through the RSS 2.0 feed.